Ohm’s law states that the current in an electric circuit is proportional to the applied voltage and inversely proportional to its resistance. 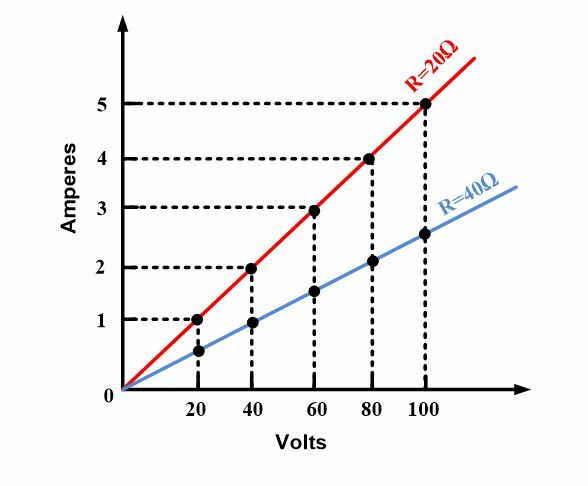 As the voltage increases in a circuit (resistance remaining constant), the current increases by the same amount. Hence, if the voltage is doubled, the current will double. Also, the amount of current in a circuit is inversely proportional to its resistance when the voltage remains unchanged. 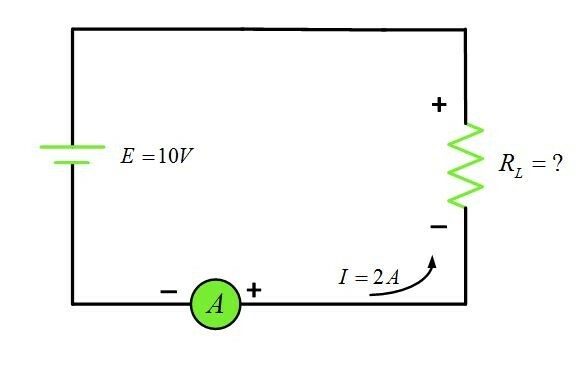 Stated another way, if the resistance in circuit increases, the amount of current will decrease. For example, if the resistance is increased three times, the current will be reduced to one-third of its original value (voltage remaining constant). An electrical pressure of one volt across a resistance of one ohm will cause one ampere of current to flow. Since R is constant, equation (3) is the equation of a straight line, for this reason, the resistor is called a linear resistor. 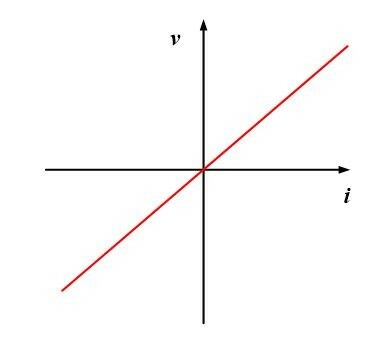 A graph of v versus I is shown in figure 1, which is a line passing through the origin with a slope of R. Obviously, a straight line is the only graph possible for which the ratio of v to I is constant for all i.
Resistors whose resistances do not remain constant for different terminal currents are known as non-linear resistors. For such a resistor, the resistance is a function of the current flowing in the device. A simple example of a non-linear resistor is an incandescent lamp. A typical voltage-current characteristic for this device is shown in figure 2, where we see that the graph is no longer a straight line. Since R is not a constant, the analysis of a circuit containing nonlinear resistors is more difficult. In reality, all practical resistors are non-linear because the electrical characteristics of all conductors are affected by environmental factors such as temperature. Many materials, however, closely approximate an ideal linear resistor over a desired operating region. A simple electric circuit is shown in pictorial form in figure 3 so that you can see the physical relation of the several components. Generally speaking, schematic diagrams rather than pictorial diagrams are used in electronics work. The diagram shown in Figure 4 represents schematically the pictorial drawing in figure 3. Observe the polarity of the ammeter connections in figure 4. note that the positive terminal of the ammeter connects to the positive terminal of the battery, while the negative terminal connects to the resistor: Note also that the ammeter is connected in series with the resistor so that all the current in the circuit must pass through it. Because ammeters have very low resistance, they do not materially increase the circuit resistance. If an ammeter were accidentally connected across (in parallel with) the battery or resistor, a very large current would momentarily flow and would likely to damage the meter. Connected across the battery is a voltmeter to read the battery voltage. Because voltmeters are normally very high resistance instruments, they do not draw any significant amount of current from the battery. Observe the polarity of the voltmeter connections. The positive lead connects to the positive terminal of the battery, while the negative lead connects to the battery’s negative terminal. A very important rule to remember is that voltmeters are always connected in parallel with a voltage source or load, while ammeters are always connected in series with the circuit or load. Here is an example to illustrate how Ohm’s law can be used to solve for the current in a series circuit. 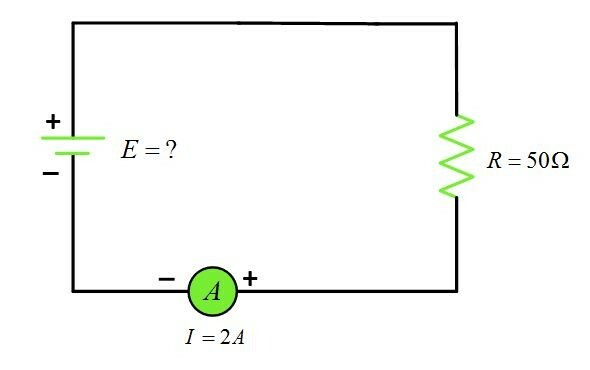 Determine the current in a simple series circuit shown in figure 4 from the information given? Therefore, 12 V connected across a resistance of 3Ω results in a current of 4 A through the resistor. In this case, the ammeter will read 4A. Refer to figure 5, determine the ohmic value of the load resistance RL from the data given. The circuit would be considered a relatively low resistance circuit because 2A is flowing with only 10 V applied. From this formula, we can see that the voltage is the product of current and resistance. The voltage drop across a resistance, or circuit, will vary directly with either the current or resistance. For example, if a current through a resistor is doubled, the voltage drop (IR drop) will double. Or if the current can be maintained at a given value but the resistance is doubled, the voltage drop will double. The following example shows how to calculate voltage, or IR, drop. 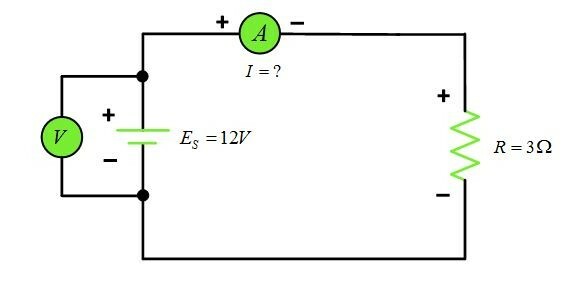 Determine the value of the supply voltage in the circuit of figure 5 from the information given. Hence, from example, we see that it requires 100 V supply to force 2A current through a 50 Ω resistor. We can say that the IR drop across the resistor is 100V, the same as the supply. No IR drop occurs across the ammeter since its resistance is assumed to be zero for all practical purposes. Previously, we learned that the current in a circuit is directly proportional to the applied voltage and inversely proportional to the resistance. If the voltage is doubled, the current will increase two times assuming the resistance remains constant. 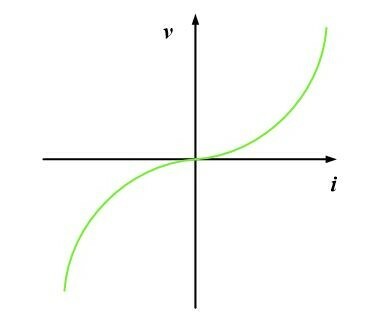 This linear relationship is shown by the top diagonal straight line in figure 7, which is a graph of the equation I=V/R for a resistance of 20 Ω. Note that the voltage is plotted on the horizontal axis and the current on the vertical axis. If we had assumed load resistance of 40 rather than 20 Ω, the diagonal line marked R=40Ω would be the result. If a resistance less than 20 Ω has been used, the resulting line would have been steeper than the one for the 20 Ω load. The curves in figure 7 show the direct proportionality between voltage and current for different values of load resistances. Ohm’s law can be easily remembered by using the simple memory aid shown in figure 8. By covering any one of the letters, you obtain the arrangement of the other two on the right-hand side of the formula for determining the value of the covered letter. 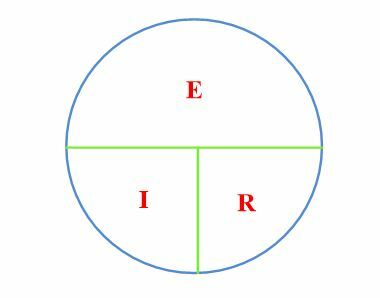 By placing a finger over the I gives E/R, indicating that I=E/R. By covering the letter E leaves IR, indicating that E is the product of IR. Similarly, if R is covered, E/I remains, signifying that R equals E divided by I. Test your understanding; answer these checkup questions. What is the basic formula for ohm’s law? What are the two derivations of this formula? What current flows in a circuit with 100 V and 1000 Ω resistance? What voltage is required to produce 2A of current through 60 Ω? What resistance will limit current flow to 4A in a circuit having a 200V supply? The resistance of a circuit remains the same, but the current through the resistor suddenly triples. What has happened to the circuit voltage? If the voltage applied to a circuit is doubled but the resistance remains unchanged, what will the current value do? If R triples and E doubles, what will be the new current value? Thanks for an informative article. I note that the answer to your second checkup question is incorrect. It should be 0.1 A (i.e. 100 V / 1000 Ohms). Thank you for pointing out..I updated an answer. Please note that, as indicated by the sign ^, it is actually a vectorial product. From this general equations you are able to evaluate the regular E=IR . But with E=IR you are not allowed to solve some complicated phenomenon, sucha s, for instance, industrial heating and lightning discharges. I agreed with your approach.It does make sense. Thank you for the note.